Tootsie Rolls: All Wrapped Up! If you’re like us, you are absolutely inundated with Tootsie Rolls during Halloween, and with good reason. These small chocolatey snacks are the perfect size when you need to satisfy that midday chocolate craving. They also are great to keep in candy dishes, desk drawers, or in your son or daughter’s lunch bag. As a matter of fact, there really isn’t a place where Tootsie Rolls won’t fit! 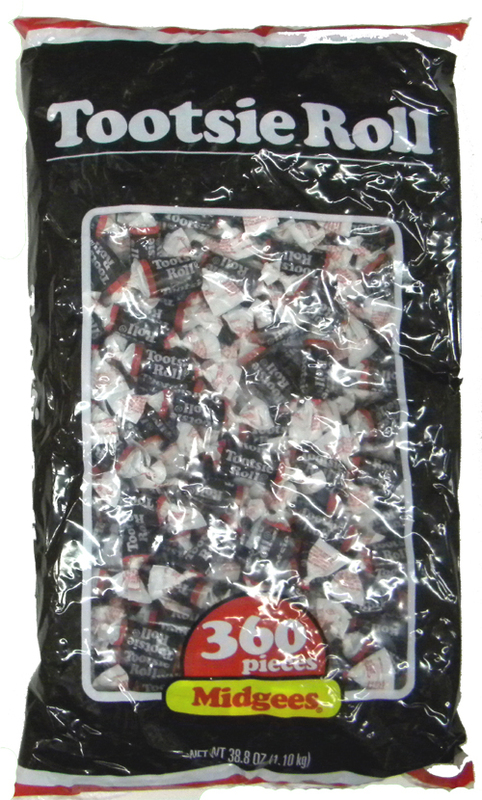 Since Tootsie Rolls are individually wrapped (they delightfully spin when you unwrap them! ), the one thing you’re left with after indulging in a roll or two is the distinctive brown, red, and white wrapper. While you could simply throw out the wrappers, where’s the fun in that? We found some great tutorials online, showing fun and unique ways to use the Tootsie wrapper after you’ve eaten the candy. Over at Plum Pudding, they have a wonderful post detailing how to turn a bag of Tootsie Roll wrappers into a stylish belt. All you need are common household craft items like scissors, packing tape, and double stick tape and 2 d-rings, which can be found at your favorite fabric store. Poking around eHow, we found this great lesson about creating those crazy purses and bags out of candy wrappers. You’ve seen these bags in stores everywhere, but you might not have known that you can make them yourself. All you need is a free day and a LOT of Tootsie Roll wrappers. Once you master the initial fold technique, you’ll be on your way to having a “sweet” purse! Do you have any Tootsie Roll wrapper craft ideas? Let us know in the comments! Don’t worry – summer’s not over yet! Even though fall is looming, the air is still warm and the sun is still, making it the perfect time to take a weekend getaway to the beach. You’ll need the basics: sunblock, swimsuits, towels, flip flops, etc. But before you get those together, you’ll need to make sure you have the absolute necessity packed – snacks! Spending the day in the sun and swimming in the ocean can take a lot of energy, so it’s important to have a good supply of tasty snacks on hand. The thing to remember is you need to make sure what you bring can withstand the heat from the sun. Unfortunately, that means no chocolate. But it’s ok! There are plenty of snacks you can bring! Barnum Animal Crackers: These classic crackers have been an American staple for over a hundred years, and it’s easy to see why. These tasty little treats are perfect for on-the-go snacking, thanks to the handy string handle. Keebler Cheese & Peanut Butter Crackers: Not only are these sandwich crackers delicious, they are also a good source of protein and calcium. You can’t beat that! Twizzlers: This low-fat candy has the perfect blend of fruit flavor and sweetness that makes it ideal of a lazy afternoon in the sand. Bonus tip: bite the ends off and you have an edible straw! Planters Dry Roasted Peanuts: Quick, easy, and no melty mess! Planters Dry Roasted Peanuts can stave off hunger while you soak up some rays and also provide you with the nutrients and energy you need to ride the waves. What kind of snacks do you like to bring to the beach? Leave us a comment and let us in on your secret!